Bertrand Russell once wrote ‘all that passes for knowledge can be arranged in a hierarchy of degrees of certainty with the facts of perception at the top’ and these degrees of certainty and facts of perception are the paragons probed in globally renowned neuroscientist Beau Lotto’s new book Deviate. It begins with an accessible introduction to recent scientific observations of human perception using the infamous white/gold dress debate to emphasise what we know and what still remains mysterious about perspicacity. Lotto asserts that this real-time field experiment captured imaginations across the globe precisely because it revealed that it’s not just those on the other side of the world, from another culture, that may interpret the world differently to us but those closest to us also. Lotto admits that an explanation for why this kind of simple simultaneous brightness contrast deviation happens is difficult to explain but suggests we might make progress if we concede that our brains ‘evolved to evolve’ to ever-changing environments, and they do this by continually redefining normality for us. It is not just impossible for us to see the world accurately but our brains do not care to, they care only about seeing the world usefully so that what we experience perceptually is the beneficial aggregate of past perceptions. Reading this, it instinctively registered as a deficit. I started to mourn all the wonderful information we’ll never get to see due to the relentless reflexive pruning our brains apply to every new experience, but according to Lotto, this is not a deficit. In fact, Deviate stresses that human beings need delusion in order to move forward and that our ability to use our imagination to find relationships, even where there may be none, is a large part of what might fuel creativity and allow us to ask the kinds of useful questions that will us allow us to find new meanings in previously ambiguous environments in the future. 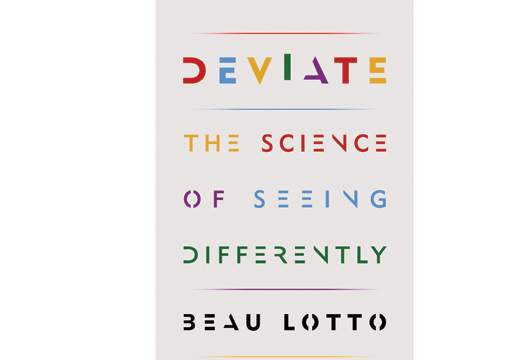 As an artist drawn to science precisely because of its robust relationship with uncertainty, I found Lotto’s thoughts on our relationship with doubt and dubiety’s role in creativity the most significant and inspiring part of Deviate. It’s central contention is that to enter a situation with questions to be answered rather than answers that must be understood is the only way we can challenge our perceptual biases and allow the possibility of learning, and it’s this simple inversion of logic, the cherry on top of Deviate’s complex and provocative systematic review of perception that could have a seminal, Socratic influence not just on creativity but in the future development of creative solutions to all human problems, from education to relationships, political debate to conflict resolution and in terms of psychology, research prep, diagnosis and approaches to the therapeutic relationship. Deviate is the best book of any description I have read so far this year. It is an ambitious and triumphant trope that skilfully argues a scientific case for seeing differently that is hard to reject once your brain has decided it might just be useful to you too.